At the Alami Proton carnival, we were treated to a sneak peek of the 2016 Proton Perdana, where for a brief moment, we were shown the front and rear corners of the car. 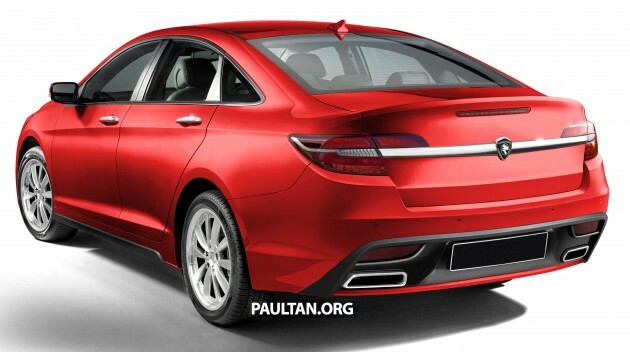 Using that minimal supply of information, rendering maestro Theophilus Chin still managed to create a few renderings, giving us an idea of what Proton’s flagship D-segment sedan will look like when it launches next year. When that time finally arrives, there certainly will be a wide array of colours to choose from and that is where these new set of renderings from Theo comes in, showcasing the new Perdana in eight different colours, including the original rendering’s silver. Aside from the separate colour choices presented – black, blue, champagne, dark grey, green, maroon, red, and silver, the renderings remain pretty much unchanged, still differing significantly from the eighth-generation Honda Accord which serves as the basis for the Perdana. Azlan Othman, who serves as Proton’s Head of Design did mention to us during the Alami Proton carnival that at launch, the Perdana will be offered in five colours, so could they include those you see here? Take your time and scroll through our gallery of colour options for the 2016 Proton Perdana and let us know which colour would suit the car best. So can it be serviced at Honda also? Just wonder how much Proton would price it? They should know ppl buy Proton because it is CHEAP, not because it is good. That’s why expensive Proton Preve/Suprima S sales so bad. Definitely cannot, ask stupid question. car may look great but quality will be a let down as with all Protons. Proton should concentrate on improving quality instead of other things. Workers are so lazy. Management are all lazy fellows. Don’t want to work hard. All the time wanting government help and sucking billions from LHDN. All the time, they just think about makan nasi lemak, tidur, kongkek kakak ipar, kahwin empat and Malam Jumaat. They should focus on improving quality. Another beauty by Proton. Thank you Proton and thank you BN for giving us a car company we can be proud of. I trust Proton fully. I have also full trust in our BN Government. They are honest and sincere. Just trust the Government when they tell you toll and car prices need to go up. They are only using the money for the nation and keeping us safe. All the 300,000 yellow shirt protestors, pls ?pack your bags and balik. What you waiting for?? Bro, how much BN pay you for this comment? Can Tol exemption if i buy local proton vehicle? CANNN! If your Perdana has royalty seal on the number plate. You mean those RM10 seal buy from a booth in some random parking lot? red silver grey black aje nice. Wow, It really looks fantastic in Red, Blue, Grey and Black.In Beige it looks fine too, but the shade of brown just “tak boleh”lah.And the green is disgusting. The design looks on the preview and the rendering for this Perdana (colours aside) is nice with the XJ’s profile and Opel Insignia rear combined with a Proton front.But Theo, the wheels on the rendering is a little too small for my liking.Theo, you could have rendered this car with a bigger version of the Iriz 1.6 wheels.Other than that, congratulations Theo for rendering a fantastic looking car.I salute you! Thank you Richard. Unfortunately, even if I enlarge the Iriz’s wheels, they are still four-nut type, which I personally find handicapped if paired to a large D-segment car like this Perdana. Those wheels you see in these renderings were actually those seen on the 2010 Proton Tuah concept. My pleasure, The rendering will look nice with enlarged Suprima S rims too, don’t you think? Other than that, I salute you! I go for green. Looks nice and it’s Proton-Lotus corporate clolour. Other colours suits it well. Did some discussion with proton staff during their recent open day. Perdana’s honda engine is not the latest. Pity perdana buyers. New body but expired stuff. Well, the japs wouldn’t let proton to wipe their market. Nvm bro.Proton will only use the Honda engine for a short moment.Maybe around 9-12 months only.After that,Proton will use their Petronas E01 engine after finish RnD to meet Euro 6 regulation. very nais indeed..i love proton. im now sending an invitation to jeremy clarkson to test drive this unit at nurburgring circuit and i am sure this new proton perdana will kick porsche turbo by more than half minutes. nice design..similar to pininfarina design..silky smooth body line and tail light concept. i must buy this car. cant wait for it to be available at proton edar. i might buy it 50 and use some of it for bajak sawah. here me using perdana for sawah, my duit more botingkek tingkek it seems..
Green and red is superb. american taste. If you look closely at the sneak-peek photo, the color of the bumper and body are not the same.. similar problem had with Preve & Suprima..
Its a pre-production car. They can even have the bumper and body in rainbow colours. Doesn’t make a difference. And, between the application of paint onto plastic and metal, there will be a very slight differentiation. You want it to be close to perfection, then you must be prepared to pay for it.